You know what they say: you just can’t have it all. Today’s Ultrabooks—which are defined by their portability, and which generally offer seductive performance and battery life combos—compensate with a correspondingly high price. But what about those who are shopping for a lightweight 15-inch notebook under the constraints of a lower budget? With its Pavilion Sleekbook 15, HP reminds us that not every slim laptop has to be an Ultrabook—whether in terms of specifications or price. Sporting an AMD Trinity A8-4555M APU with Radeon HD 7600G graphics, 4 GB DDR3 RAM, a 1366x768 resolution display, and a weight of under 5 pounds, it’s an effort to preserve some of the most critical aspects of Ultrabook appeal without inflating the price tag beyond the reach of most budget shoppers (our review model can be had for under $500 at HP’s official website). It’s a model which competes in two different spaces: that of the ultraportable/subnotebook (it’s only a hair heavier than the 2 kg “limit” for the classification), and that of the budget laptop. But does it succeed as a member of either category? As always, we’ll break it down for you in every conceivable way. 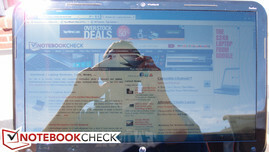 Upon first glance, it’s the Sleekbook’s slim form factor which immediately makes an impression. Measuring in at just 20.6 mm thick and weighing only 2.1 kg (around 4.6 pounds), it’s not your average 15-inch budget notebook. 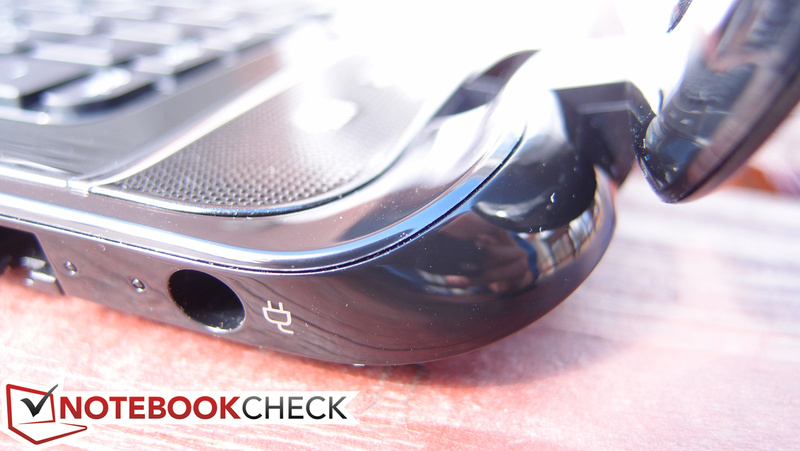 Its closest competitors, such as the Acer Aspire V5-571G, struggle to match its measurements. The Aspire, for instance, has a comparable footprint, but is slightly heavier and thicker in comparison—though it also includes a DVD+/-RW drive. Considering the trends of the industry, the omission of the drive seems rational to help save weight, and as a result, it’s hard to find a much more portable 15-inch notebook, especially at the price point. It’s also (appropriately enough) sleek-looking, featuring flashy high-gloss finishes on every surface (except the bottom) and an otherwise clean-looking and uncluttered design—though, as expected, it’s a fingerprint magnet. 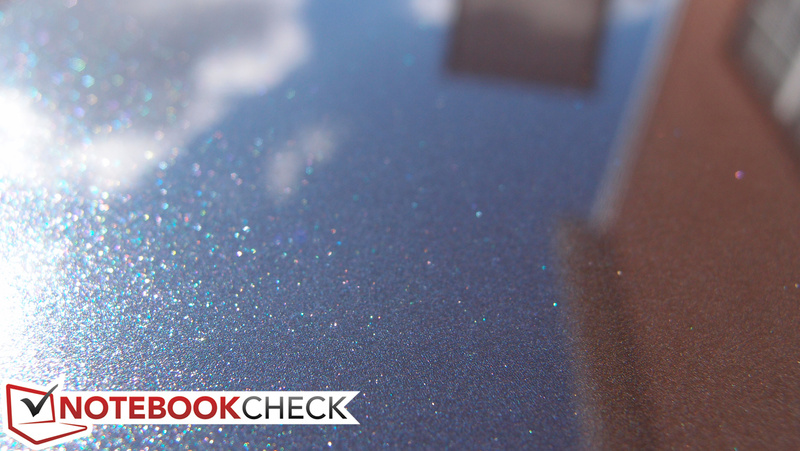 The color of our review unit, called Sparkling Black, did just that in the light. Two other colors (“Ruby Red” and “Winter Blue”) are also available. 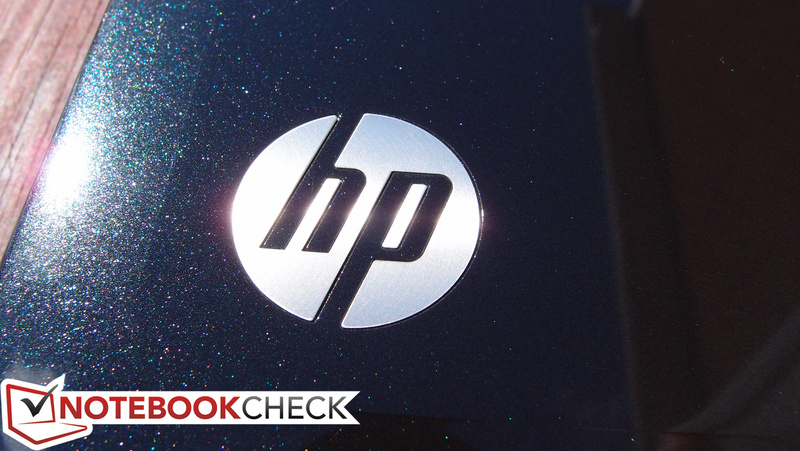 A sole chrome-colored HP logo adorns the lower-left corner of the lid. Workmanship on the machine we received was also consistent, with no gaps in between parts and a commendable fit and finish—though there is a separation between the plastic parts on the hinges where the display lid cover and bezel pieces meet that makes us feel like disassembly/reassembly wouldn’t be much fun in the event of a broken LCD panel (a scenario which isn’t too farfetched considering the flimsiness of the display lid). 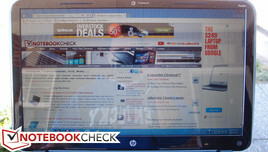 In spite of its smooth construction, however, the Sleekbook can’t hide the concessions of its value-oriented design for long. This is a notebook entirely comprised of plastic, none of which feels overwhelmingly sturdy. While the base of the unit seems rigid enough, the screen and its surrounding hardware hardly inspire confidence. The display lid’s torsion resistance is unimpressive as well; it can be easily twisted with very little effort, and depressions from the back are visible on the LCD panel. Meanwhile, the plastic-covered hinges, while perfectly able to support the screen, don’t feel like they could take very much abuse. 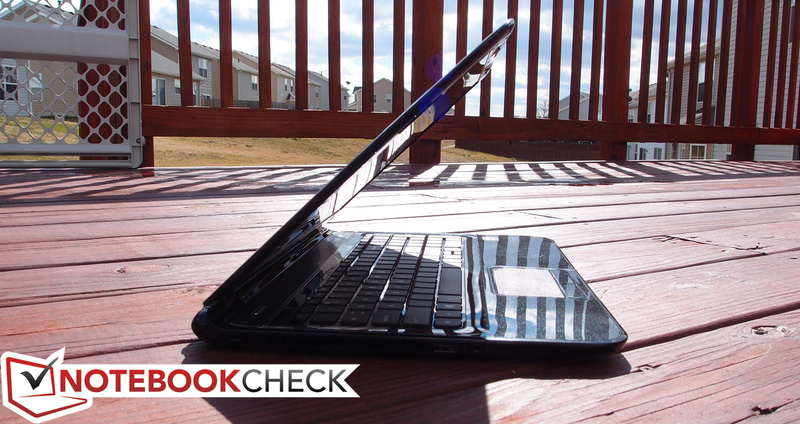 Overall, due in part to both its low price tag and its featherweight plastic construction, the Sleekbook exudes a notable sense of fragility. Taking into consideration the slimness of its body, the Pavilion Sleekbook 15 fortunately leaves little to be desired in terms of available ports. You’ll find three USB ports (two of which are USB 3.0) and one video-out port (HDMI), along with the often-omitted (on many ultraportables) card reader. There’s also an Ethernet port which expands to fit the cable when inserted. About the only negative is the fact that most everything is crammed along the right-hand side of the notebook, primarily because half of the left-hand side is consumed by the large exhaust vent. As you can see in our photos below, the two USB 3.0 ports and the HDMI port are so close together that you might have to leave the middle port open to accommodate many devices with larger ends. For wireless connectivity, our review unit features an Atheros AR9485 802.11b/g/n WiFi Adapter, which supports up to 150 Mbps data rate. This chip is known for its low power consumption, though its performance pales in comparison to more expensive Intel models. Still, we experienced no dropouts or connection stability issues throughout our testing of the notebook (WLAN driver 10.0.0.212). Bluetooth wasn’t included, but it’s available for just $15 more if you build your own PC at HP’s site. 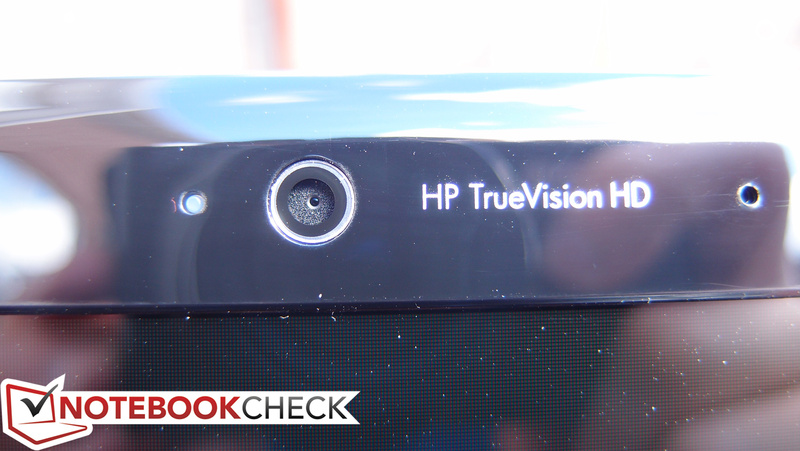 A 720p resolution HP TrueVision HD webcam is included as well, which seemed to work fine in our testing. No other networking options exist, but this should be more than enough for any budget PC user. 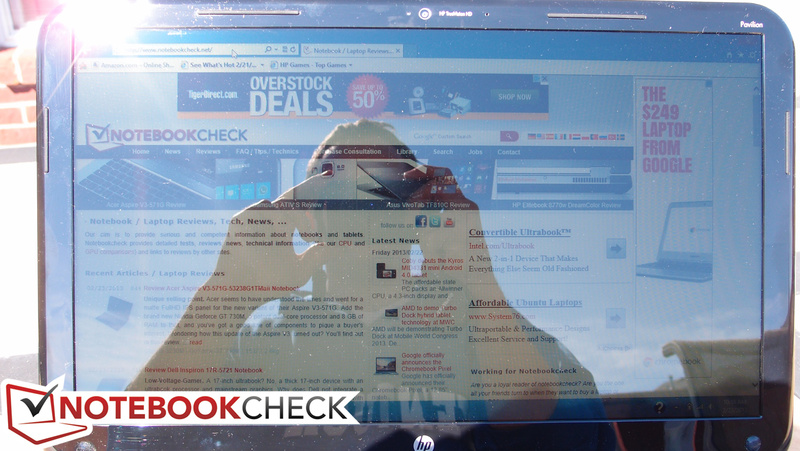 Considering the Sleekbook’s target market, it’s no surprise that specialized accessories are not available for it. 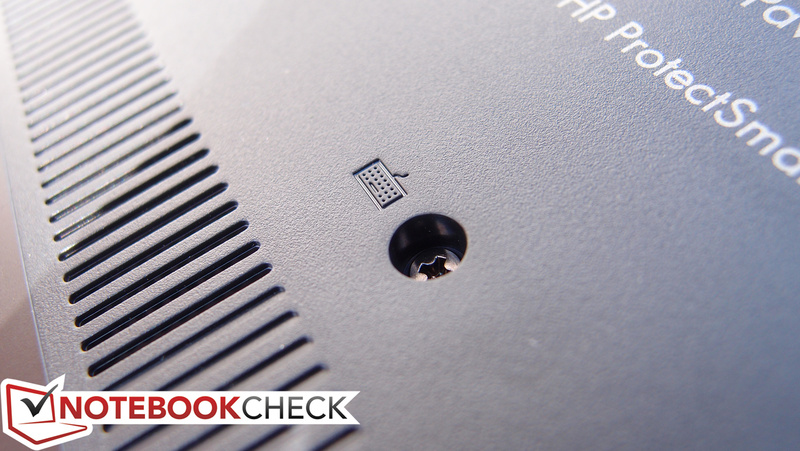 If the lack of an optical drive bothers you, HP does provide the option of purchasing an External Tray DVD+/-RW drive (which connects via USB) for $50; however, comparable and more affordable options exist elsewhere and can easily be had aftermarket. The only accessory included in the box is the power adapter, which is a regular-sized 65 W model. A different, “slim travel” power adapter can be purchased for under $70 currently at HP’s website. 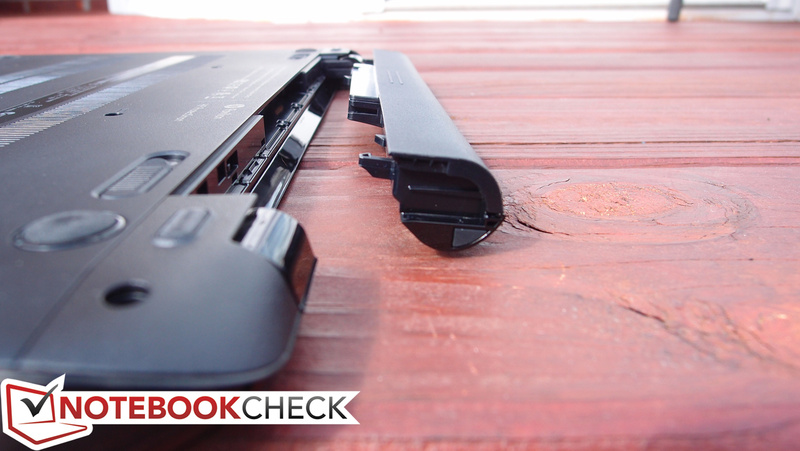 The Sleekbook comes standard with a 1-year warranty. For $90 extra, an additional year of protection can be added. Accidental damage protection is also available. 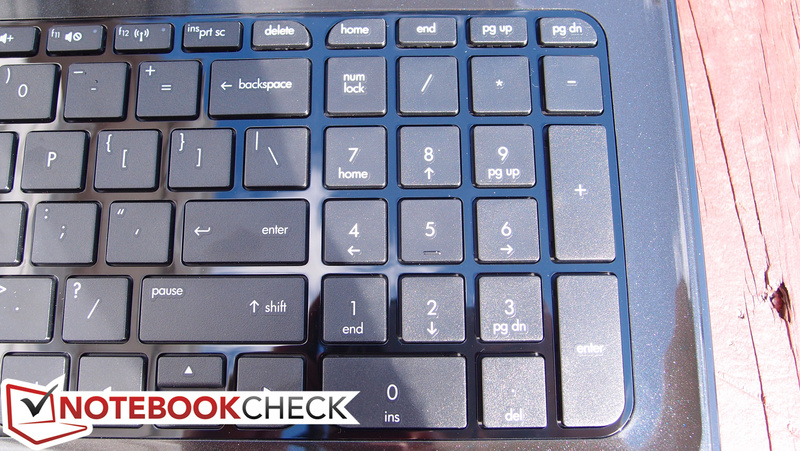 The full-sized, Chiclet keyboard on the Sleekbook 15 is thankfully quite spacious (except for the half-sized vertical arrow keys), providing a low typing error rate. It even includes an integrated number pad, something which is of great benefit to anyone who works regularly with spreadsheets. However, those positive qualities are quickly overshadowed by the keyboard’s problems. The keypresses feel spongy and imprecise, with shallow key travel and a mushy stopping point. We found it difficult to tell whether or not some keystrokes had registered—a problem which makes typing frustrating and far too much of a mental exercise. Couple that with considerable flex in the center of the keyboard (near the i and L keys) and you have a disappointing keyboard. As always, over time, some natural adjustment occurs and matters tend to improve; but no matter how you slice it, there are far better keyboards than this one available on even budget models. The sufficiently large Synaptics brand touchpad features a textured surface (raised dots to be precise—see our macro photo for a better idea of how it looks) and is comfortable to use. 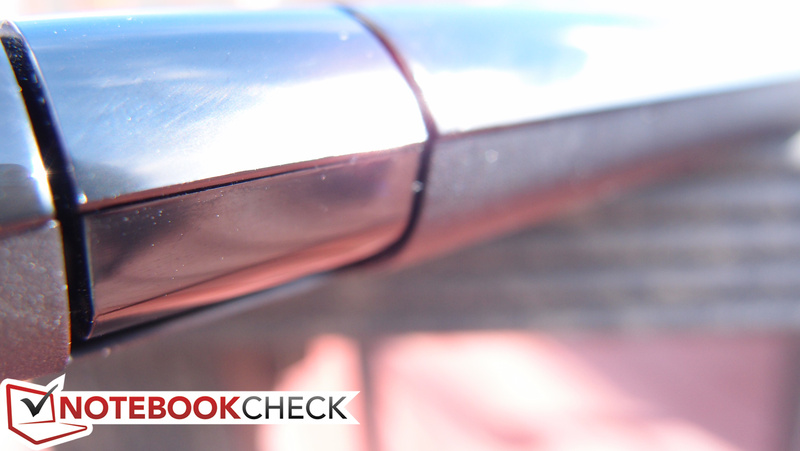 The texture provides for better gliding across the touchpad’s surface, even in spite of the notebook’s glossy finish. A single depression in the upper-left corner of the pad serves as a virtual on/off button for the touchpad—though in our testing, it surprisingly wasn’t always reliable in its operation. The two buttons below the pad click decisively and audibly, radiating through the surrounding plastic of the palm rest (into which it they are integrated). We also found gestures to be relatively accurate, with a few mishaps here and there, but nothing more pronounced than with other comparable notebooks. The 15-inch display features a resolution of 1366x768, which is the standard resolution for mainstream and budget notebooks of this size. No other resolutions are available for configuration. Most users in the market at this price point won’t be bothered by this, however. The display also features a very glossy finish, something which can limit its use in brighter environments (which we’ll get to in a moment). 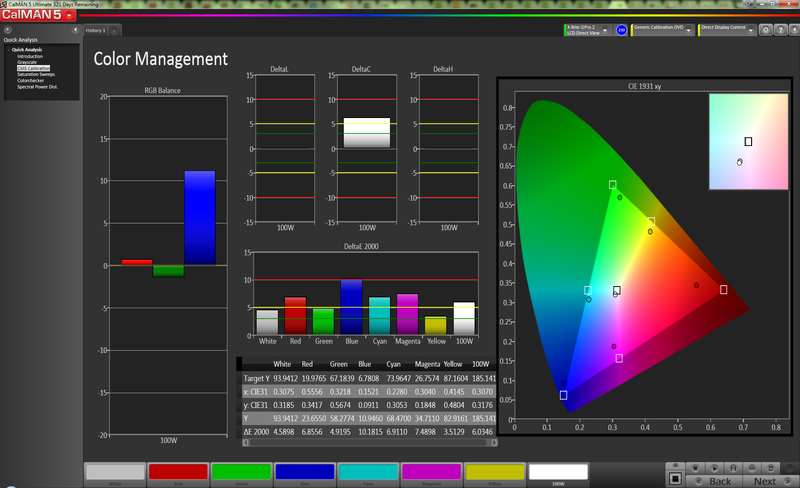 Subjectively speaking, the screen provides a slightly dim picture with acceptable color reproduction. Our measurements yielding an average brightness of just 167 nits reaffirm our subjective impressions of the panel’s relative lack of luminosity. 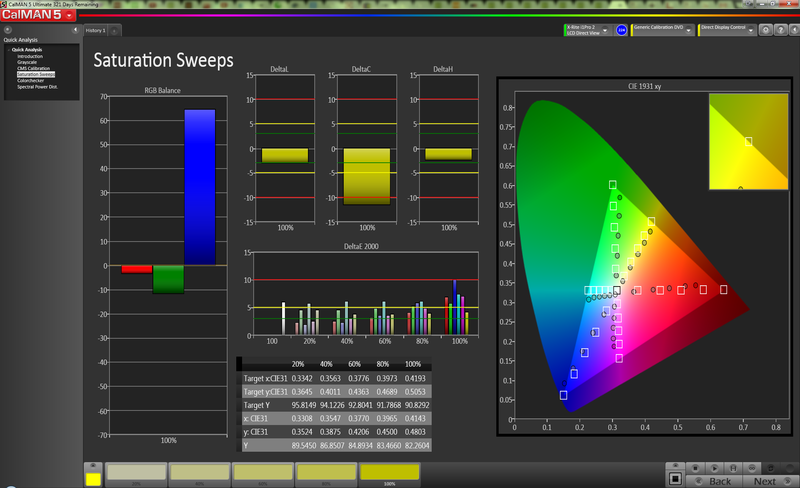 Fortunately, the brightness distribution of 91% means nearly uniform radiance across all areas of the screen. The black level of 0.88 isn’t bad either, resulting in a contrast ratio of 198:1 (low, but not terrible) even in spite of the weak brightness values. The low contrast means that this notebook may not be the best choice for lengthy video sessions—but it likely won’t bother those who are simply looking for a basic machine for web surfing and productivity. The Sleekbook’s LCD panel manages a color space reproduction of 64 percent of sRGB, which is slightly above average, but nothing remarkable. The average low-cost TN panel typically manages around 60 percent coverage, while more expensive panels (such as those of mobile workstations or RGBLED screens) are generally close to or above 100 percent. Users with needs involving professional graphics or photography will likely want to look elsewhere to satisfy their requirements. 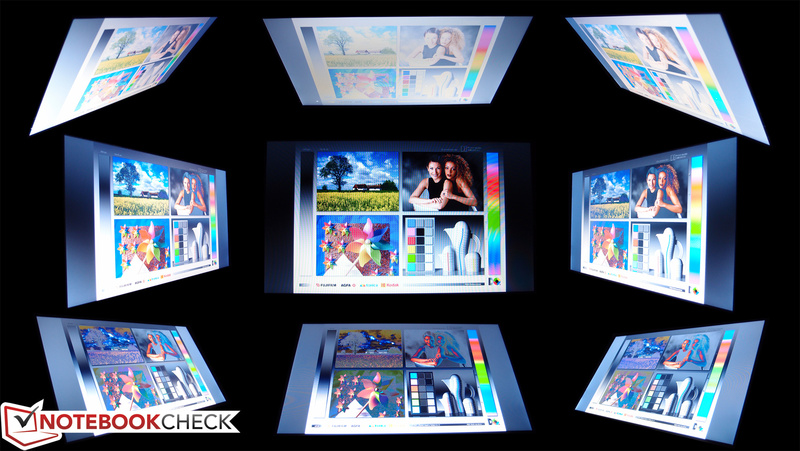 After calibrating the display, we also evaluated the Sleekbook’s LCD panel using CalMan 5 as a part of a new standard in our reviews. Overall, the display’s performance post-calibration isn’t all that bad, though the blue scale sees a significant deviation of around 10.2 DeltaE. Red, cyan, and magenta also exceed the 5 DeltaE mark, but, while noticeable to the trained eye, that’s not as much of a concern. Thanks to the display’s very glossy surface coupled with its low brightness and unremarkable contrast, outdoor usability is severely limited. In shaded areas—if properly positioned—comfortable use is possible, but under direct sunlight the screen is all but impossible to make out. On a positive note, the display’s maximum brightness is not reduced when running on battery. And regardless, indoor usage poses no problems; most users will likely prefer a setting of around 9/10, which is close to 150 cd/m². Finally, in terms of viewing angles, the screen is once again predictably average. Horizontal deviation doesn’t produce much of a problem, but as usual, vertical viewing angles are very restrictive, with color inversion and washed-out brightness quite prevalent at 45 degrees. The display lid itself can open to around a 135 degree angle. 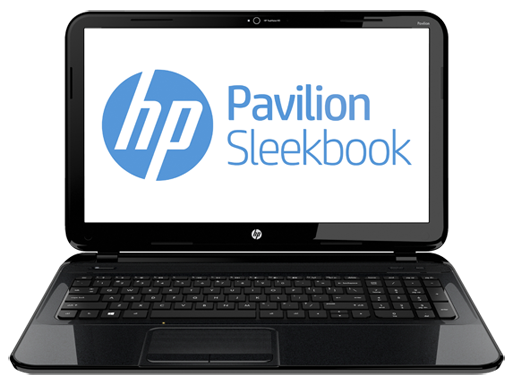 Our Pavilion Sleekbook 15 features a 1.6 GHz AMD A8-4555M ULV (ultra-low voltage) quad-core APU. 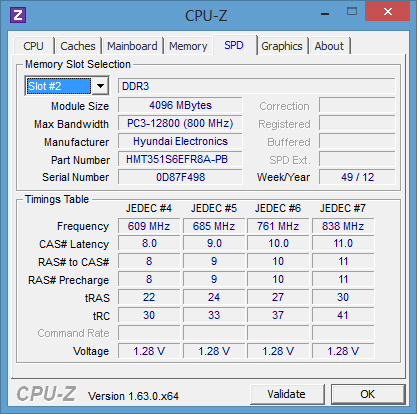 This processor is manufactured using a 32 nm SOI and is based on the Piledriver architecture. Thanks to Turbo Charge 3.0, it can boost its clock rate to 2.4 GHz when needed—but with a respectable 19 W TDP, it does a good job of sipping power until absolutely necessary. 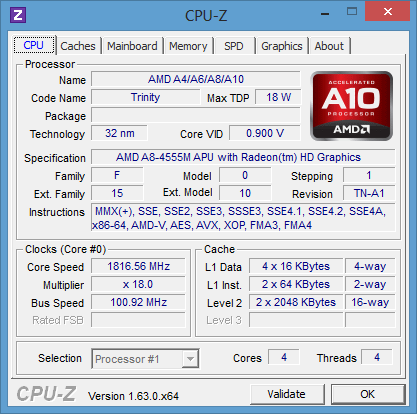 Other options include less expensive dual-core APUs A6-4455M (2.1 GHz to 2.6 GHz) and A4-4355M (2.0 GHz to 2.5 GHz) for $50 and $75 less, respectively—or, if you’d like better graphics, another $50 will buy you an upgrade to a Radeon HD 8550M dedicated GPU. With regard to system memory, our review model was equipped with a single 4 GB PC3-12800 SODIMM module from Hynix Semiconductor. It’s worth noting that aftermarket memory installation is nearly impossible for the average user on the Sleekbook; nearly every component in the notebook, including the system board, must be removed to access the RAM. 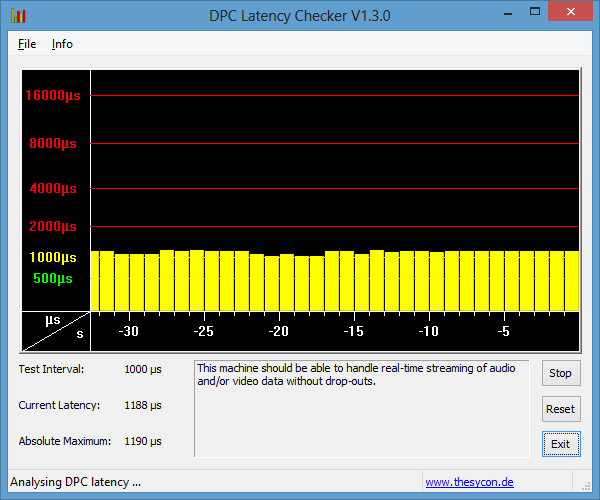 DPC Latency Checker reveals no problems, suggesting that the system ought to be able to handle the streaming of real-time audio and video without any hiccups. Keep in mind that this program hasn’t yet been updated to be fully compatible with Windows 8—so the results suggest higher latency (by around 1000 µs) than is likely the case. 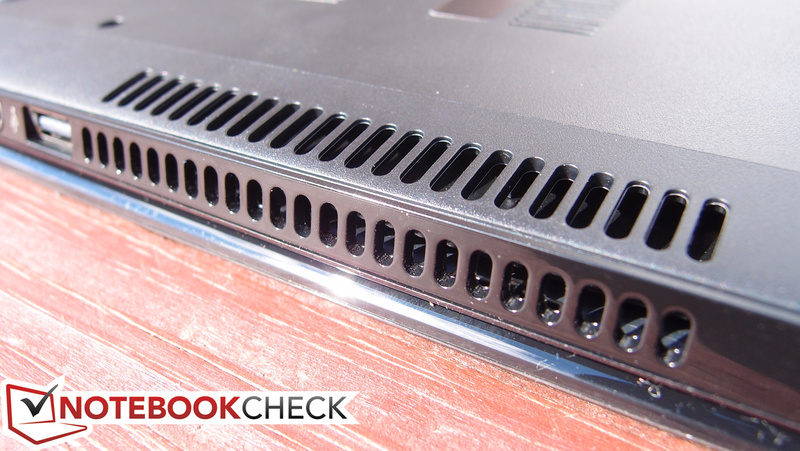 Our synthetic benchmarks suggest that the Sleekbook 15’s performance is just about on par with that of the only other notebook we’ve tested with the same APU (the Lenovo IdeaPad S405). In some tests, we found inferior results (such as in wPrime and superPi, where the Sleekbook’s scores lagged by as much as 5%), but in other tests, such as Cinebench R11.5’s 1xCPU 64-bit and OpenGL benchmarks, we saw clearly superior results. Ultimately, the values are close enough to be considered negligible in their differences. Another major point of consideration is that both tested models only included single channel RAM—which, thanks to the design, severely limits the GPU’s performance. We’ll discuss this more extensively later on in our review. For now, be sure to check out our dedicated page for this APU for a growing list of tested machines. Finally, to check whether the machine’s performance was detrimentally affected while running only on battery, we performed a subsequent run of 3DMark 11 with the AC adapter disconnected. The result of 668 confirms that the machine is unaffected regardless of power state. 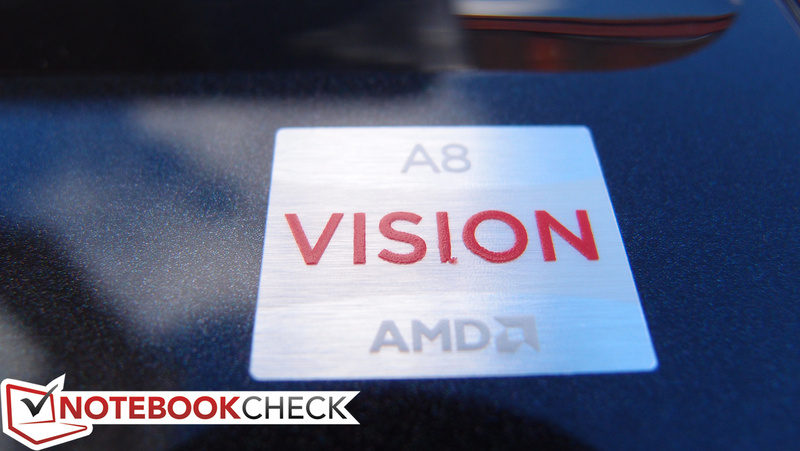 The AMD A8-4555M APU in our Sleekbook 15 review unit sips power with a TDP of just 19 W. However, unlike Intel’s competing ULV offerings in the Ivy Bridge line, the performance is not impressive. Our benchmarks place it just barely above the Celeron and Pentium CPUs from Intel, and nearly all ULV Core i3 CPUs are already faster. 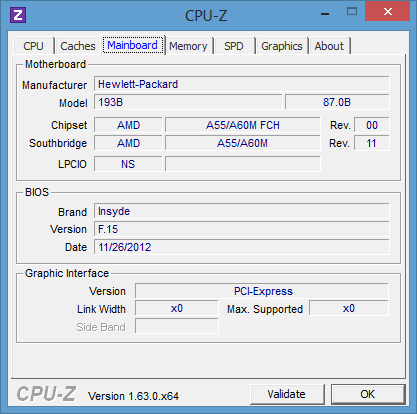 For example, Cinebench scores such as 1.23 on R11.5 CPU Multi 64-bit are dwarfed by even Intel’s Core i3-3217U CPU (which scores an average of 1.7), and is closer in comparison to the Sandy Bridge i3-2357M (whose score is a 1.2 average), which actually manages a slightly lower TDP of 17 W. In short, don’t expect to be buying into any significant amount of processing power with the Sleekbook 15. Needless to say, one of the sacrifices made to satisfy the price point is the inclusion of a solid-state drive (SSD). 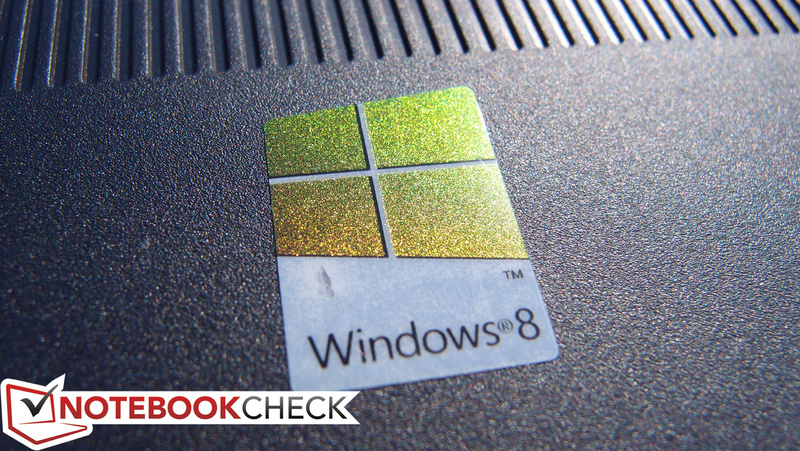 Ultrabooks are required by Intel’s specification to include an SSD, which typically greatly improves system performance—especially in the synthetic PCMark benchmarks, which are heavily dependent upon the speed of storage devices. 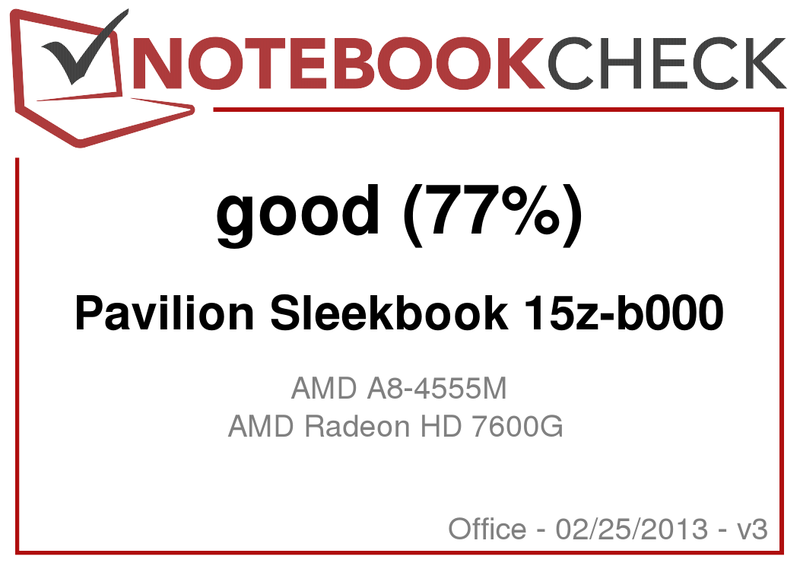 Thus, the Pavilion Sleekbook 15 posts unexceptional scores in PCMark 7: just 1505, which is around 7% below even the IdeaPad S405’s 1627, and far below the scores of comparable Ultrabooks with SSDs (at much higher price points), which are typically as much as three or four times higher. Having said that, user experience isn’t always perfectly correlated with the results of such synthetic tests, which heavily favor the presence of an SSD; our impressions from the general use of the notebook were that it was quick enough for most everyday tasks—even if it did seem a little sluggish under more demanding circumstances. PCMark Vantage, at the time of this writing, is still incompatible with Windows 8. In the meantime, check out the Windows 8 Experience Index scores below for another point of comparison for overall system performance. 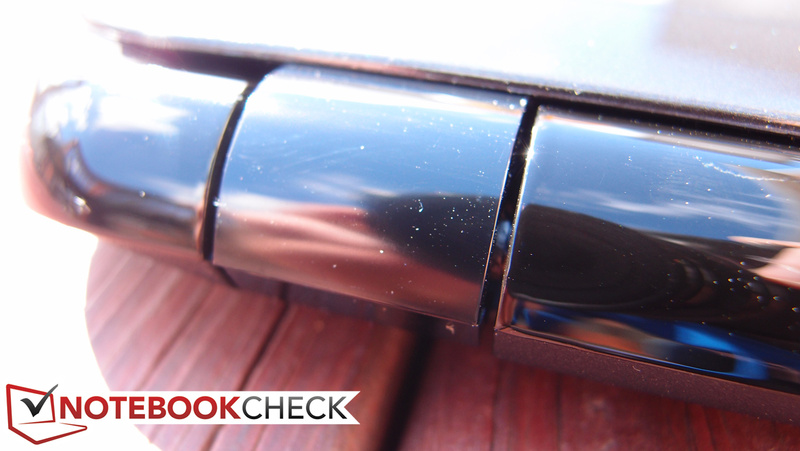 Our Sleekbook 15 was equipped with a 500 GB Hitachi Z5K500 5400 RPM hard drive. 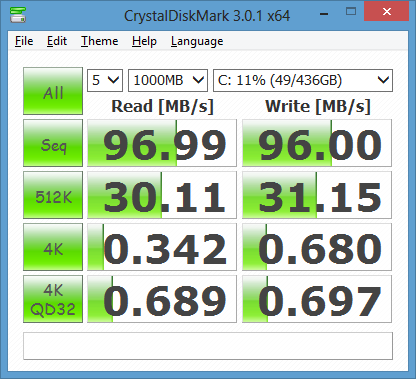 Although it’s not a 7200 RPM drive, the scores posted by this model rival that of many slower 7200 RPM drives (it’s one of the fastest 5400 RPM drives we’ve tested). Nevertheless, drive speed can have a significant impact on overall system performance, so if you’re interested in an upgrade, it’s just $10 to make it a 7200 RPM drive instead. Other options exist, including a 750 GB 7200 RPM drive, as well as 5400 RPM drives of capacities ranging from 640 GB to 1 TB (the latter of which will set you back an additional $110). No SSD options are provided, but aftermarket upgrades are possible, if not necessarily convenient; removal of the keyboard and the palm rest/top cover is required to access and swap the hard drive. On a more positive note, the drive height is the standard 9.5 mm (as opposed to 7 mm, which many ultraportables are adopting to make additional room), so replacements should be easier to come by and more affordable. 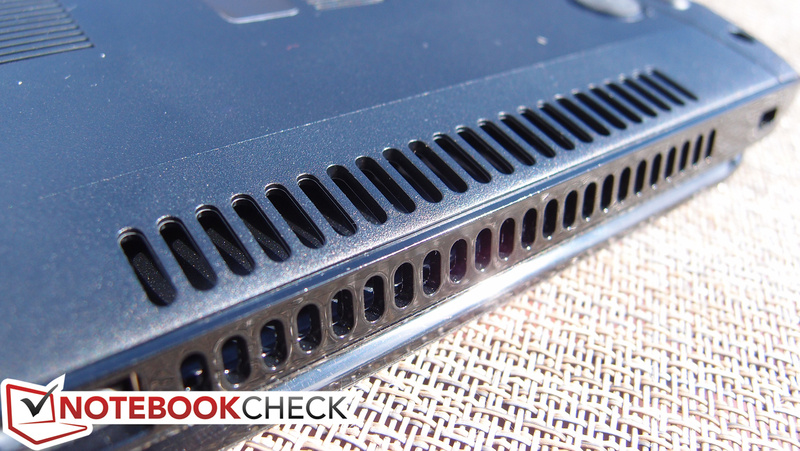 Our Pavilion Sleekbook 15’s integrated GPU is the Radeon HD 7600G, which has only seen one other round of benchmarks in the Lenovo IdeaPad S405. 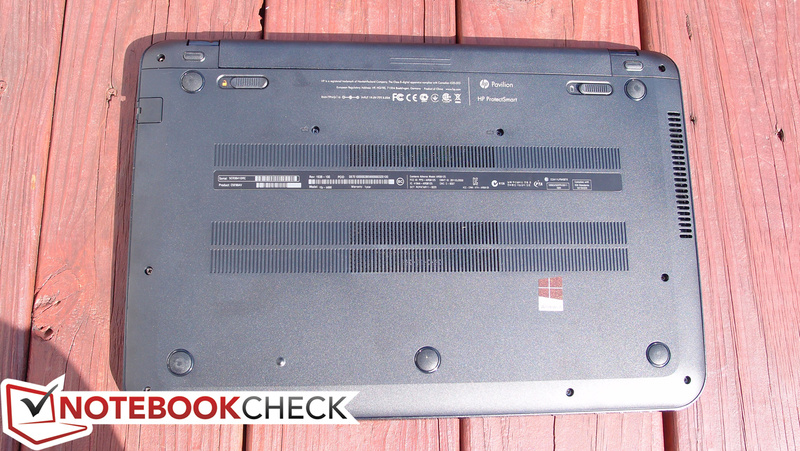 Nevertheless, our scores were similar to those of the IdeaPad’s, if not a notch lower in some tests. Scores such as 670 in 3DMark 11 and 3302 in 3DMark 06 aren’t going to turn any heads (or play many games), but such is to be expected considering the price point and ULV APU necessitated by the slim form factor. In fact, most games aren’t even playable at Low settings, which is disappointing. We tested both Starcraft II and Diablo III on low, medium, and high settings, and only Starcraft II was even remotely playable at just 49 fps on the lowest settings (Diablo III never managed above 27 fps). Overall, it’s safe to expect comparable graphical performance to many of the Sandy Bridge ULV CPUs featuring Intel HD Graphics 3000. Part of the reason for this is that our tested model only includes single channel RAM, which seriously limits the performance of the AMD Trinity integrated GPUs. Tests from other sources indicate an increase in GPU performance of as much as 70-90% with dual channel memory—that’s an enormous difference considering the relative affordability of such an upgrade. For that reason, it’d normally be a good idea to take advantage of any discounted memory upgrades on HP’s configuration page (since aftermarket memory upgrades in the Sleekbook 15 are unfortunately all but impossible). However, this may not even be worth doing, as the system appears to be subject to throttling when stressed even for short periods of time (we will cover this in more detail in a later section of this review). 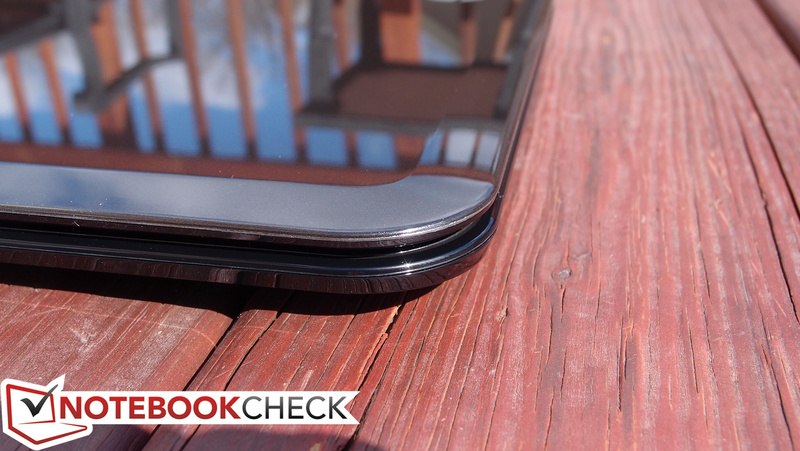 One overwhelmingly positive aspect of the Pavilion Sleekbook 15 is its noise level. 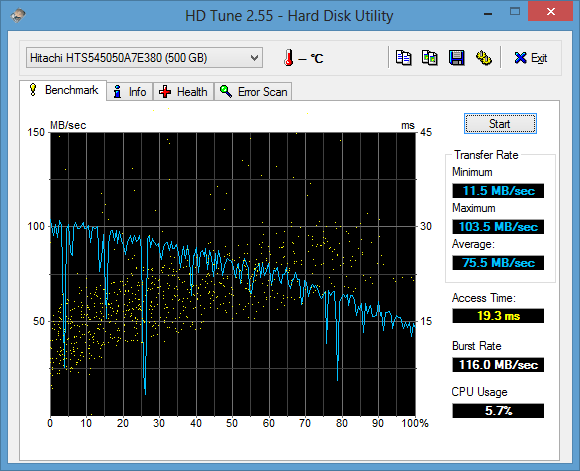 At just 32 dB(A) while idle, the notebook is barely audible. 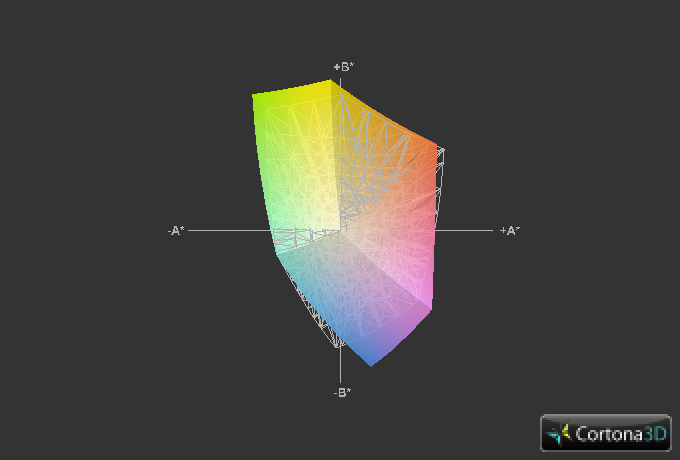 The fan becomes noticeable under heavy load with a median noise value of 37.3 dB(A), but it never borders on annoying. The tone of its operation, even at higher RPMs, is deeper (as opposed to whiny), and the sound is probably mitigated further by the inclusion of the rather large vent on the left side of the notebook (which, as previously noted, is nearly half the width of that side). Best of all, the notebook remains nearly silent even during normal operation, such as web browsing or word processing. We had a hard time hearing it when it wasn’t doing something taxing. There is one exception to this, however: the hard drive. While it isn’t exactly noisy, the hard drive’s mechanical musings can be heard straight through the notebook’s thin plastic casing. This is more a factor of materials than it is the model of the drive itself; but of course, replacing the drive with an SSD could always serve as a surefire solution to the problem. 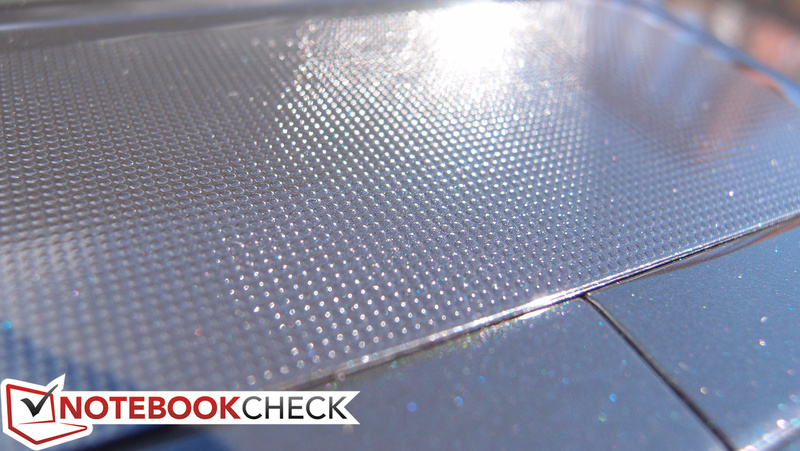 Another area where the Sleekbook succeeds is that of temperature. To assess a notebook’s thermal design, we sample temperatures from 18 different zones—9 on the top of the base, and 9 on the bottom. When idle, the notebook’s warmest point is on its bottom underneath the location of the hard drive (opposite the exhaust vent)—reaching just 33.2 degrees C. This is actually a bit warm, but hardly uncomfortable. Meanwhile, with a maximal value of just 38.8 degrees C, the notebook is merely warm under load—never hot. On the top of the notebook’s base, we didn’t record any readings above 31.8 degrees C, which was right in the center of the keyboard. Meanwhile, the bottom of the laptop gets slightly hotter, with the highest temperature found in the front center of the base (just underneath the touchpad). While selective benchmarks can certainly be helpful, it’s good to know whether or not a machine can handle seriously taxing circumstances. 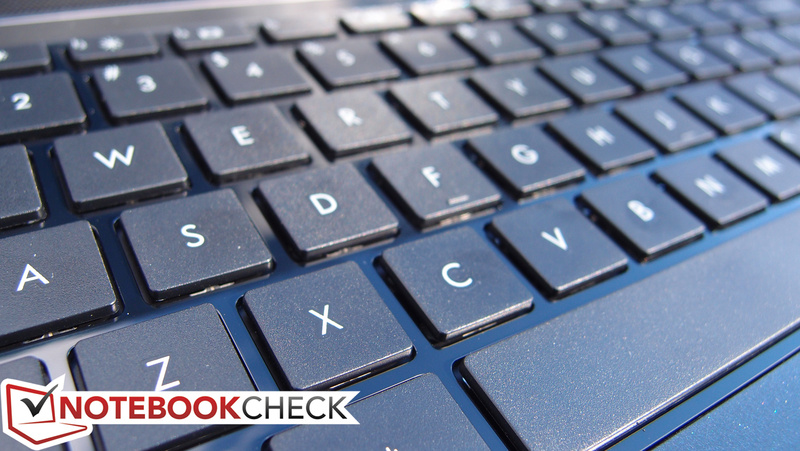 As part of our rigorous methodology here at Notebookcheck, we subject every machine to a stress test. During this procedure, we use Prime95 and FurMark to subject the notebook to full CPU stress, full GPU stress, and finally, maximal system stress (CPU and GPU). During our full CPU stress test (using Prime95), all four virtual APU cores remained at 1.8 GHz for some time before eventually dropping below the base clock rate, presumably due to climbing temperatures (this throttling begins at around the 56 degrees C mark). 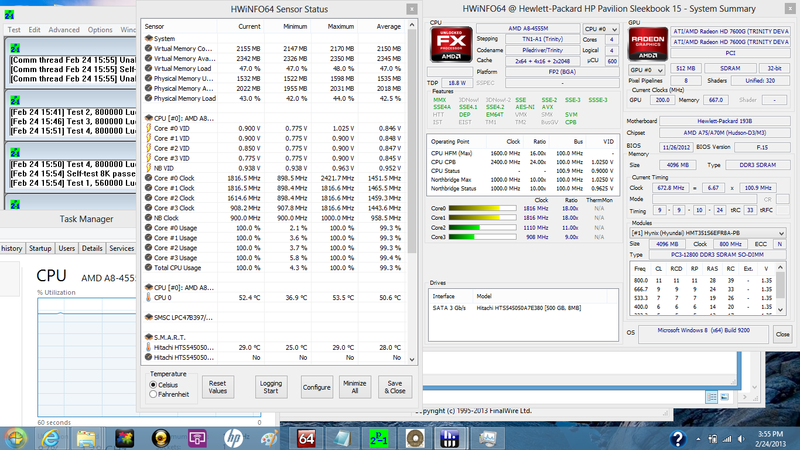 From there, the clock rates leap around wildly on all four cores, never reaching a value anywhere north of 1.8 GHz. 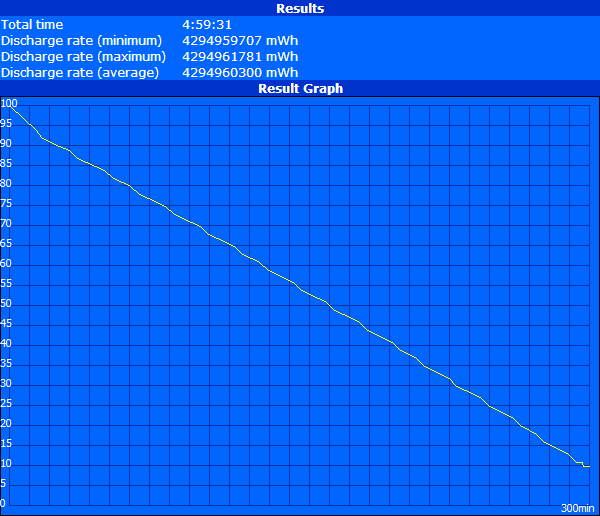 Next, in our full GPU stress test (using FurMark), the GPU clock rates at first jump to the turbo frequency of 424 MHz. But before long—under a minute into the testing—the clock rate quickly falls permanently to 200 MHz, which is below the base clock rate of the GPU (of 320 MHz). Predictably, graphical performance suffers accordingly, with the recorded FurMark frame rates eventually resting near 9 to 10 frames per second. 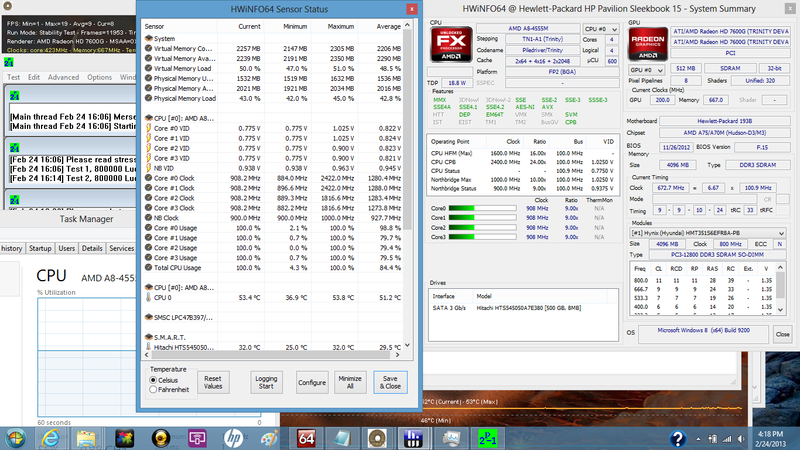 Finally, during the full system stress test (using both FurMark and Prime95), the system simply didn’t stand a chance. 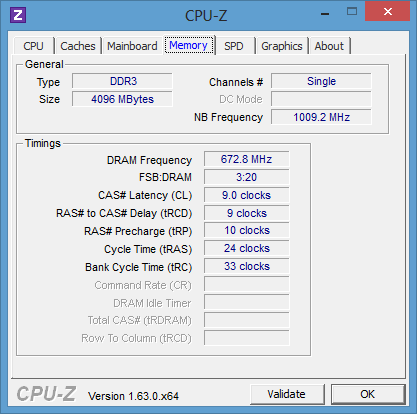 Not only did the APU clock rate remain solid at 908 MHz (just half the base clock rate), the GPU clock rate never budged from 200 MHz. 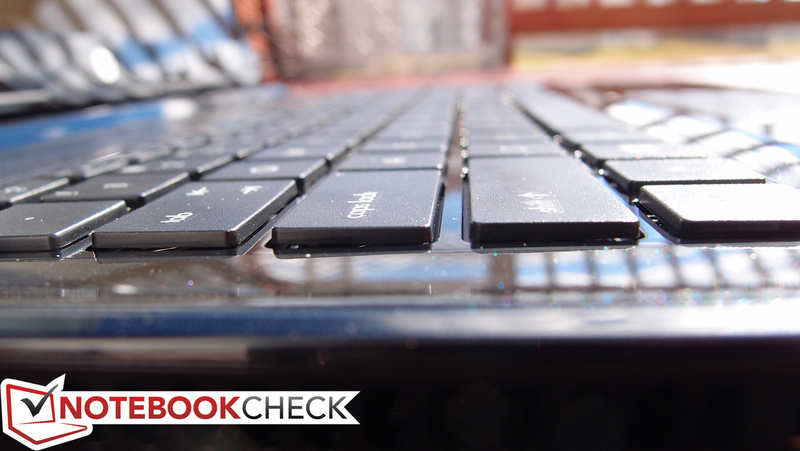 System performance was so heavily affected that the touchpad was almost unusable under the circumstances. We were curious whether or not such throttling extended beyond the 100% stress periods we imposed on the machine. 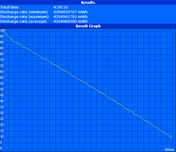 To check, we performed subsequent runs of both 3DMark 11 and 3DMark 05 following 20 minutes of full system stress. Strangely, the scores didn’t change much (they were only very slightly lower, at 661 and 5411 respectively), so it doesn’t appear to have had an effect on the notebook beyond the testing period. It’s possible that this is due to the fact that, in spite of the machine’s penchant for clock rate reductions under a short period of stress, temperatures still remain reasonable at around the 50 degrees C mark. Or, of course, it’s also possible that the machine is simply experiencing similar throttling during the benchmarks already. 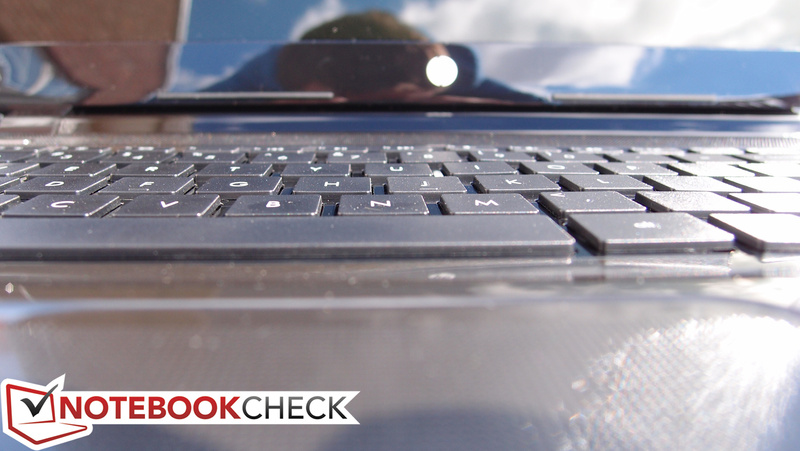 From our testing, it’s clear that the Sleekbook 15 simply isn’t suited for any truly demanding computing tasks. 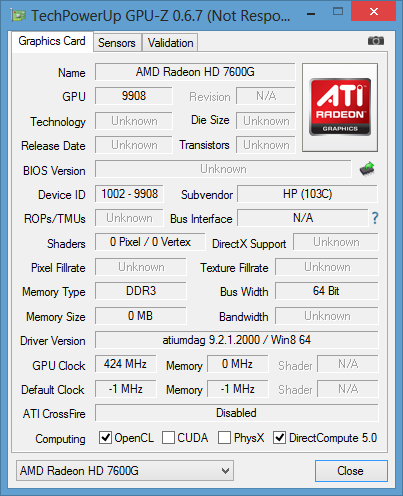 Although the conditions are unlikely that 100% APU stress will apply for any extended period of time (except for during, for instance, media encoding sessions), it doesn’t appear that full stress is even necessary to provoke the throttling; the temperature climbs so quickly and the throttling sets in so readily that it would likely affect the user even during less intensive tasks. Meanwhile, heavy GPU stress is a common situation if you’re planning on any sort of gaming—but as we mentioned earlier, unless the system is outfitted with dual channel memory, that really wouldn’t normally be much of an option anyway. 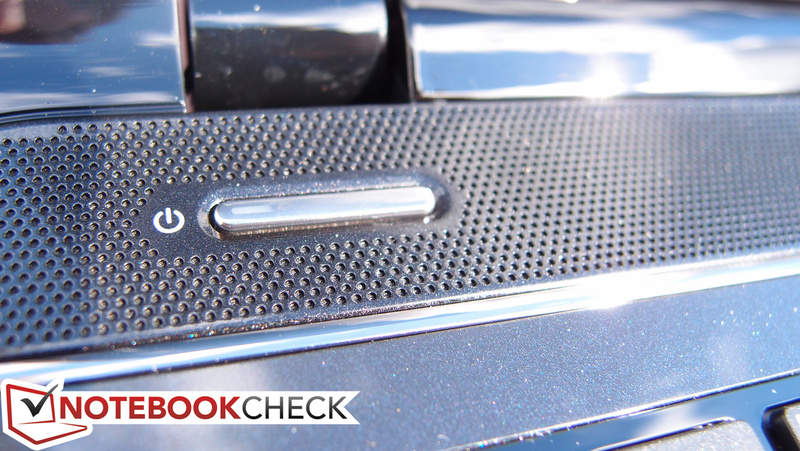 The Sleekbook’s stereo speakers are located underneath the control center strip at the top of the keyboard. 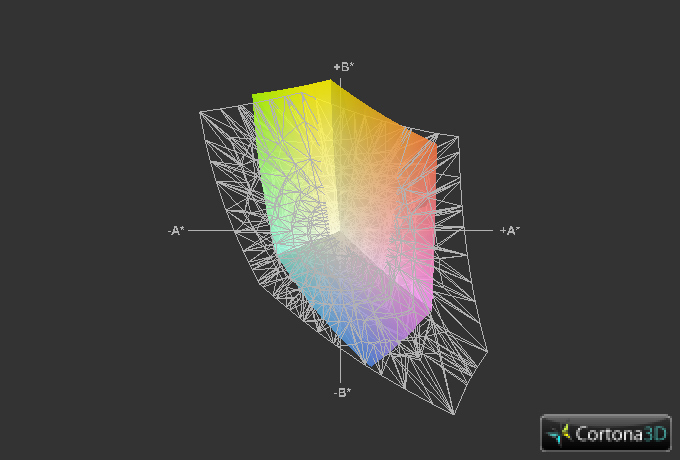 In spite of the machine’s thin profile, a reasonable volume level without distortion is possible. 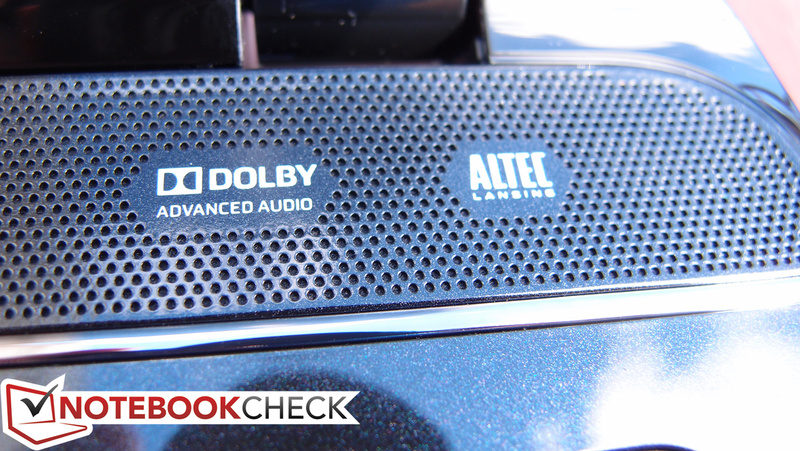 The sound quality is clear enough, though the frequency distribution seems a bit off—mostly on the low end and in the lower midrange, which is to be expected considering the small physical size of the drivers. However, thanks to our findings during the next section of our review, you likely won’t be using this notebook for any extended periods of video/movie viewing. 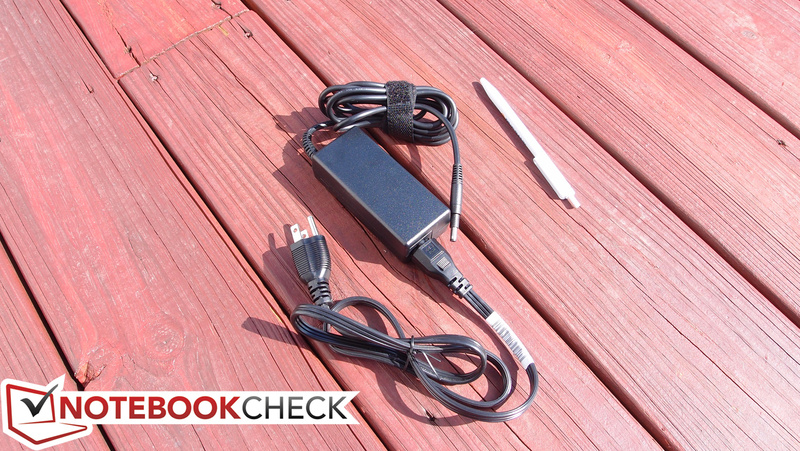 The Pavilion Sleekbook 15 unit we tested came with a 4-cell, 37 Wh lithium ion battery installed. 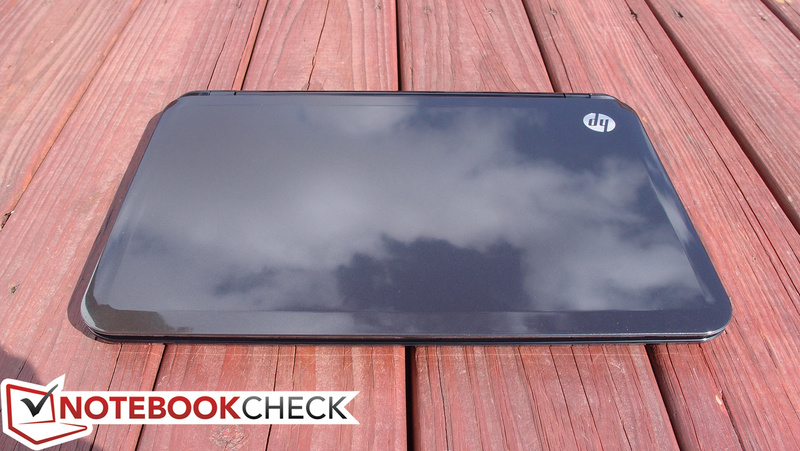 This is the only battery currently available for purchase from HP that is compatible with this notebook. It’s tiny and fits flush with the case. Our extensive battery life tests assess each machine’s longevity under a variety of scenarios; we use the popular Battery Eater application to facilitate these tests. Under our first test for maximum battery life, we set the notebook’s power plan to Power Saver, disabled all wireless radios, and set brightness to a minimum. 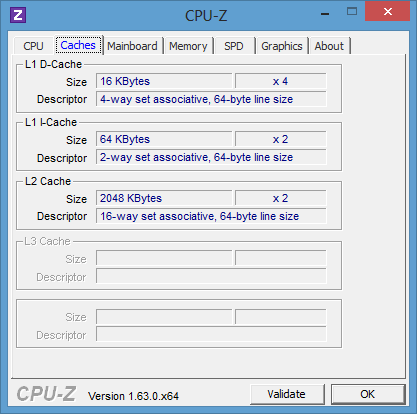 With these settings, we recorded a total runtime of only 5 hours. 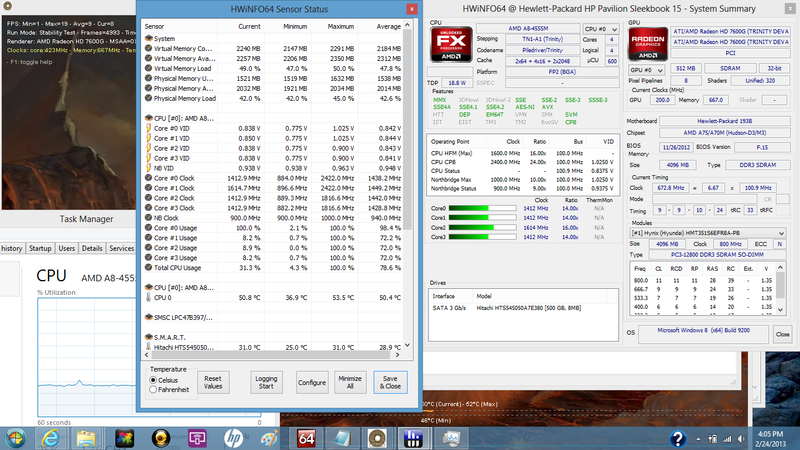 This is well below the results of most modern ultraportables, and even 37 minutes less than the IdeaPad S405. 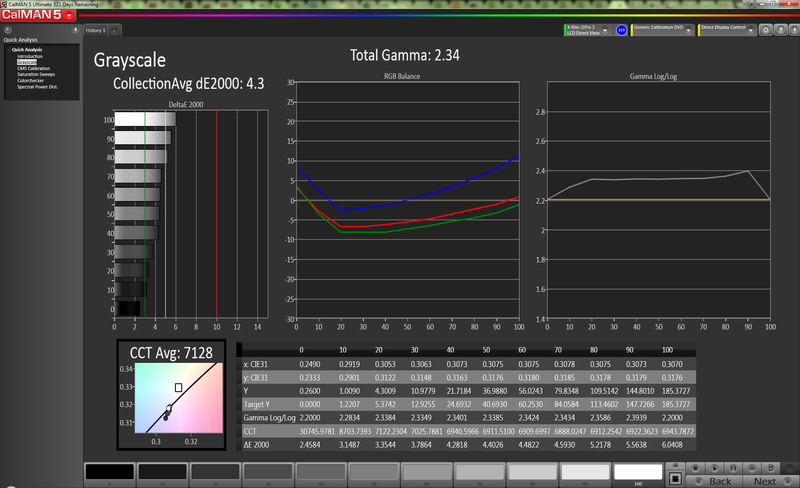 The results were slightly better under maximal load. Here, we configure the notebook to the High Performance power profile, reenable all wireless radios, and set brightness to maximum with no screen or other timeouts enabled. We then perform Battery Eater’s Classic Test to stress the system. 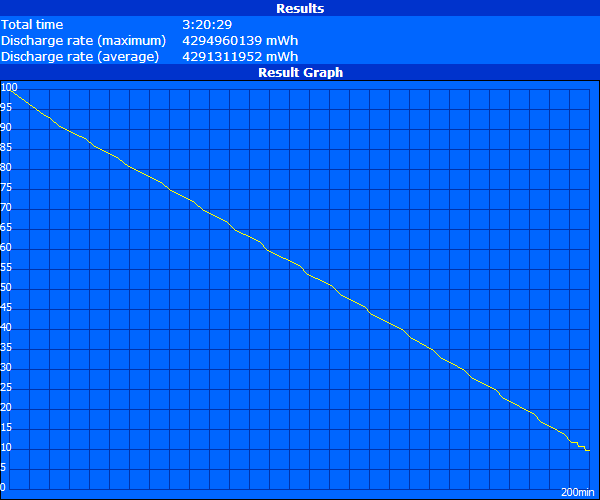 Under this configuration, we recorded a minimum battery life of only 1 hour, 27 minutes. Finally, for a more realistic idea of how long the notebook will last under typical usage, we turn to our real-world test. Here, we set the notebook’s power plan to Balanced and adjust the screen brightness to around 150 cd/m² (level 9 of 10 on our test unit). We then run a standardized script which simulates typical internet surfing behavior across a variety of websites. The result we received under this test was 3 hours and 20 minutes. This time is better than the IdeaPad S405’s abysmal 2 hours and 55 minutes (and it even bests the Aspire V5-571G, also equipped with a measly 37 Wh battery, by a few precious minutes), but is a far cry from the 4.5+ hours boasted by most modern Ultrabooks. It’s a bit of a shame that, with the low TDP of AMD’s A8 APU, we don’t see better results in these tests, but here again, this is merely the difference between a budget laptop and a full-priced Ultrabook. 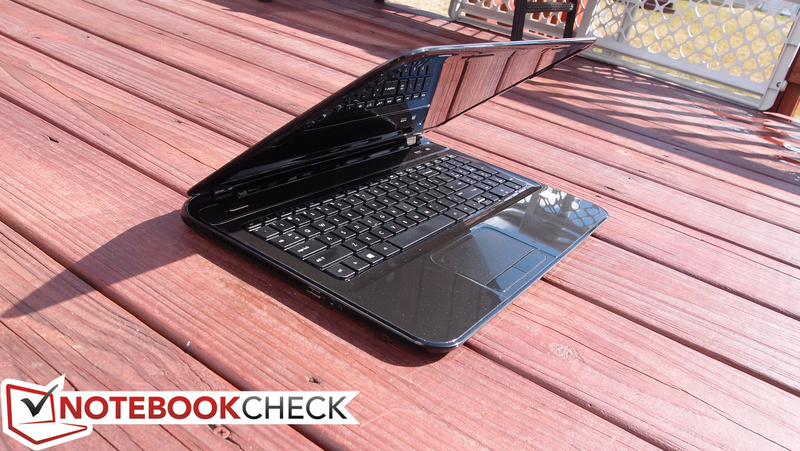 At a price point of under $500, it’s hard to argue with the basic premise of the Pavilion Sleekbook 15. Weighing in at just 2.1 kg (4.6 lbs), it’s one of the most portable 15-inch notebooks around, and it manages this feat even without exchanging heft for heat. It’s also a very quiet notebook, normally remaining close to silent (save for some hard drive noise). Not many other notebooks have come along which can match its specifications at a similar value. 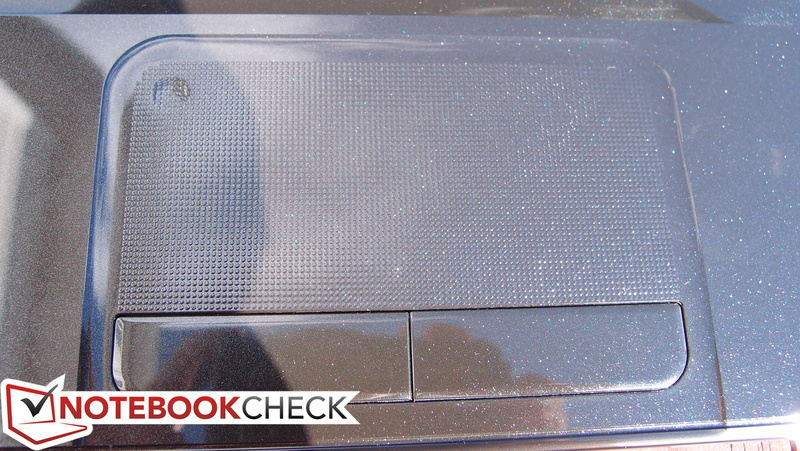 But the Sleekbook still cannot escape its markings as a budget notebook. In spite of its nigh-ultraportable triumphs, the trade-offs that result become glaringly obvious after just a short period of use. For starters, its lightweight plastic construction feels cheap and fragile, and the display lid’s torsion resistance is worrisome. The keyboard is also overall quite poor, with extremely shallow key travel, mushy operation, and a conspicuous flex located dead center. Meanwhile, performance fails to impress in nearly every regard, with scores trailing competing notebooks of a similar price point and form factor. This sacrifice in speed does not provide any benefits in the way of battery life, either: the Sleekbook’s longevity is overall unremarkable and, at best, restrictive—even if it does manage to top a couple of its comparable peers. But what does this mean if you’re in the market for a lightweight 15-inch notebook priced below $500? There really aren’t a lot of options out there, though they are slowly increasing in number. We’ve frequently referred to the Lenovo IdeaPad S405 throughout this review as a point of comparison (seeing as its specs are very similar), but that’s a 14-inch model. Additionally, the Acer Aspire V5-571G is worth considering, but it’s both thicker and heavier, breaking the 5 pound barrier. 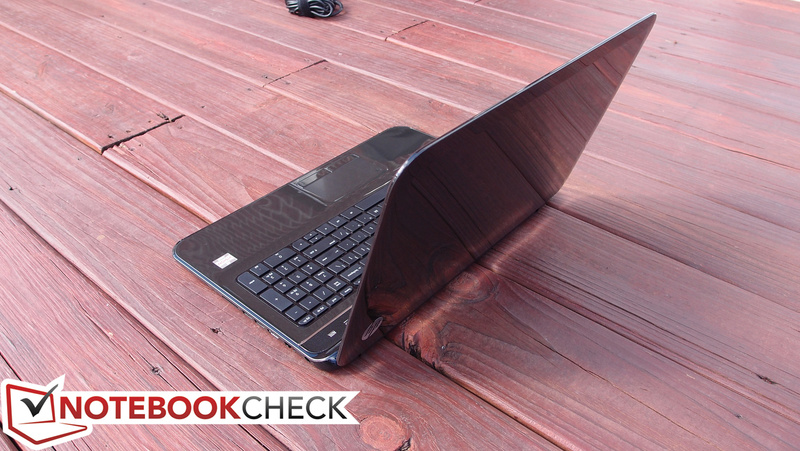 Finally, you might consider the Asus X501A; though we haven’t tested it yet, it’s both cheap and portable. 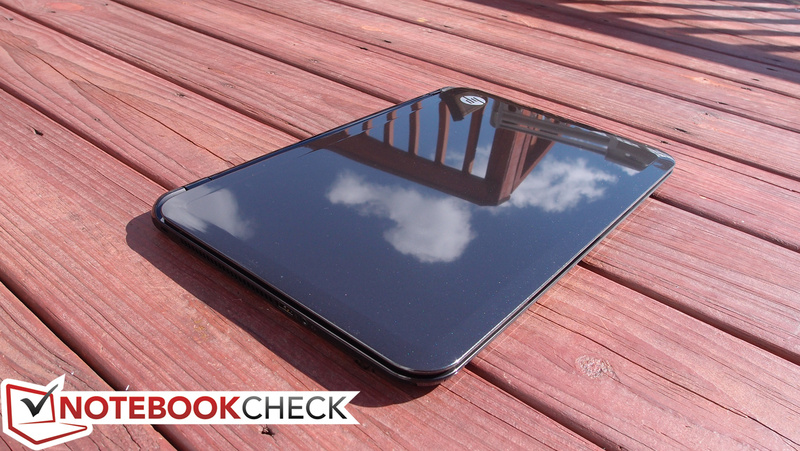 Overall, though, in spite of its lack of competition, it would be difficult to recommend the Pavilion Sleekbook 15 unless you’re dead set on its combination of strengths. 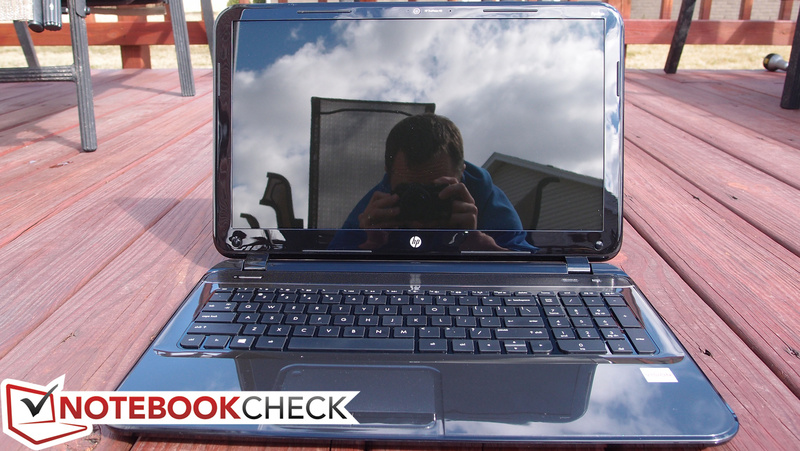 For a little more money or a little more size, much more well-rounded notebooks can be had; to that end, be sure to check out the HP ProBook 4545s or the Pavilion g6-2200sg instead. ...and an average-sized power adapter provide the juice. The Ethernet port expands to fit the cable. ...but a correspondingly shallow key travel. The Pavilion Sleekbook 15 manages an elusive balance of size/price/weight that ultimately results in one of the most affordable 15-inch, sub 5-pounds notebooks to date. Stronger build quality, a much better keyboard, and better overall performance would be a great starting point. 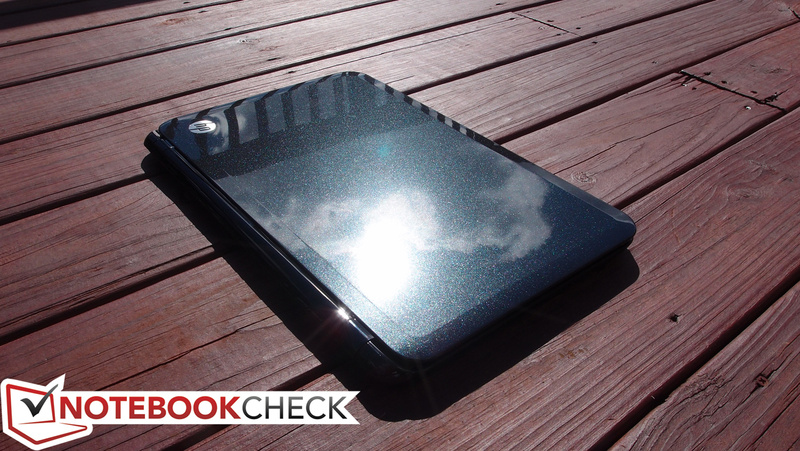 On top of that, the restrictive battery life and high-gloss screen limit its versatility on the go. How cool the notebook manages to stay under load, and how quiet it remains in spite of this is impressive.